POSTED January 17, 2019 3:52 p.m.
Iowa–Grant junior Olivia Liddicoat joined elite company when she became just the third player in school history to score 1,000 points in her prep career. Liddicoat scored 17 points, had 10 rebounds and passed out five assists to lead the Panthers to a 51–37 non-conference victory over visiting Belmont last Tuesday night. 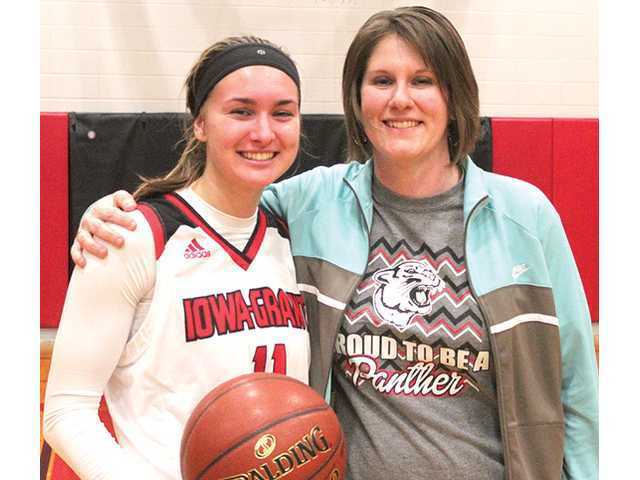 In the process Liddicoat joined Mary (Bunker) Schauff, the Iowa–Grant girls’ all-time leading scorer, and Isaac Anderson, the I–G boys’ all-time leading scorer, as the only Panthers to score 1,000 points in their career. Just a junior, Liddicoat has a legitimate chance to catch Bunker’s program record of 1,370 points sometime during her senior season. Bunker, a 1996 graduate of IGHS, scored her 1,000th point in the final game of her junior year. Liddicoat has now scored 1,037 career points with seven games left this year after scoring a team-high 15 in Friday’s 56–41 loss to Darlington and nine more in Monday’s 58–45 loss to Potosi/Cassville. Gillen and Taber each went 5–0 with four pins to win individual titles and lead the Belmont/Platteville wrestling team to a third-place finish at its own 11-team tournament last Saturday. Gillen (9–1) pinned Victor Tanev of Lake Millers in the 132-pound title match, while Taber (14–10) stuck Dodgeville’s Austin Phalen early in the third period to win the 126-pound title. Freshman John Burbach (120), sophomore Brady Johnston (138) and junior William Schaefer (195) also won individual titles for the Braves. Lancaster scored a game-high 24 points in undefeated and second-ranked Darlington’s 59–56 non-conference victory at Black Hawk Saturday afternoon. Lancaster also poured in a game-high 22 points as the Redbirds (12–0, 6–0 SWAL) survived Southwestern’s best shot, 58–52 last Thursday night. Oswald scored a game-high 16 points and hit the eventual game-winner on a driving layup with 1:24 left to lead Platteville to a 56–54 victory over visiting River Valley last Friday night in a battle for first place in the SWC. The Hillmen improved to 10–3 overall and 4–0 in the SWC. Oswald, who missed Platteville’s previous four games with a badly sprained right ankle, is averaging a team-high 17.4 points per game. Ubersox (23–2) was one of four WarBirds to go unbeaten on the day, with two picns, a tech nicad fall, a major decision and a forfeit victory, to help the Darlington/Black Hawk co-op to a 4–1 mark and a second-place finish at last Saturday’s Madison La Follette Duals tournament. The WarBirds defeated Kettel Moraine 45–28, La Follette 55–22, Racine Horlick 61–15 and Waukesha West 38–37 before dropping a 45–33 decision to champion Whitnall in the final round. Wagner is on fire as of late. The Lancaster senior has made 11 of 16 3-point attempts (68.8 percent) in three Lancaster victories over the past week. Wagner made a career-high six triples and finished with a scored a game- and season-high 25 points in last Tuesday’s 58–47 victory over Boscobel. Friday night she went a perfect 3 for 3 from beyond the arc, 8 of 14 overall, and finished with a game-high 19 points, 3 rebounds and two assists in a 50–40 SWC win at Dodgeville. Monday night, she finished with 15 points, five assists and four steals in a 59–43 non-conference win at Fennimore. Wagner is shooting a sizzling 51.2 percent (21 of 41) on 3-pointers and averaging 13.9 points and a team-high 4.4 assists per game for the Flying Arrows (9–5, 2–3 SWC).